Pamela Tiffin: A Toast To Tiffin: Hallelujah, Baby! 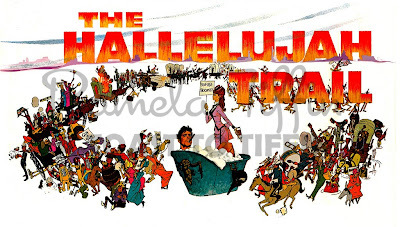 Based on the novel by William Gulick, John Sturges' The Hallelujah Trail is the whacky western spoof that tells the tale of Col. Thaddeus Gearheart (Burt Lancaster) who has to get a cargo of forty wagons of whiskey to awaiting Denver miners all the while intercepting a group of temperance marchers led by Cora Templeton Massingale (Lee Remick), the free Denver militia, guided by visionary "Oracle" Jones (Donald Pleasance) and an entire Sioux Indian nation who have their own ideas of what to do with all that liquor...if they get their hands on it. The film was a no holds barred all star comedy event with the obligatory climactic, zany chase sequence. The chase sequence is impressive and makes the most of the Ultra Panavision 70 cinematography of Robert Surtees. 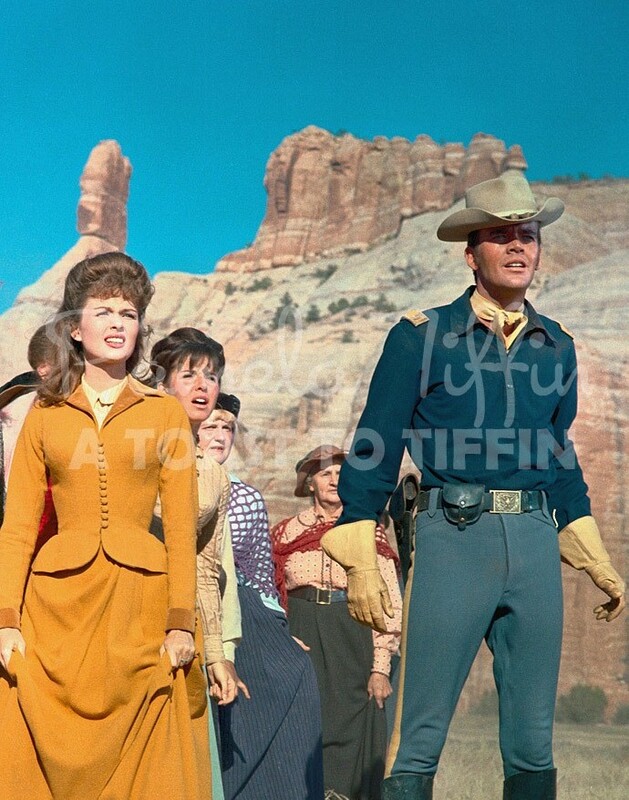 Pamela Tiffin and Lee Remick on the set of John Sturges' The Hallelujah Trail. 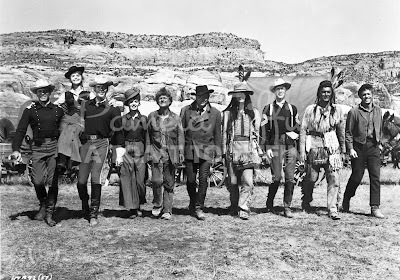 Unfortunately stuntman Bill Williams was killed during the filming of this chase sequence when he failed to jump clear off a wagon that was headed over a cliff. Martin Landau and Donald Pleasance scene steal every chance they get in their respective roles of "Oracle" Jones and Chief Walks-Stooped-Over. 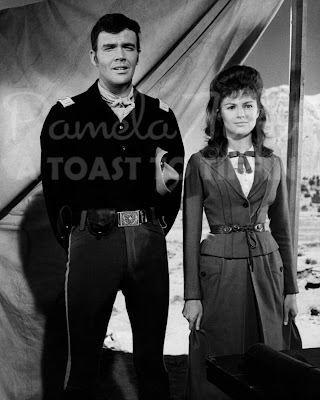 Jim Hutton co-stars with the beautiful Pamela Tiffin in John Sturges' western spoof, The Hallelujah Trail. Pamela unfortunately is stuck in another one of her ingenue roles, playing Burt Lancaster's feisty daughter "Louise" and does the best with a part that mostly amounts to attractive window dressing. 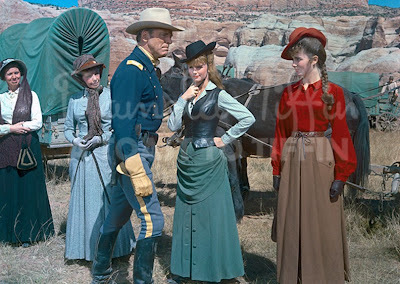 She looks beautiful throughout, which goes without saying and she must have been a sight to behold on the ginormous Cinerama screen this film was shown on during it's initial premiere engagements. 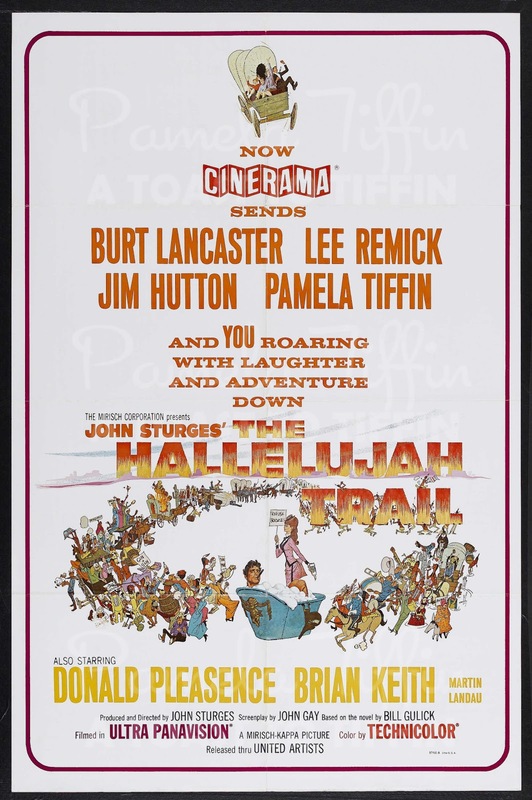 Lancaster in one of his few comedic turns comes off well, Remick is a delight and Hutton is reliable as Tiffin's romantic interest but the film's jokes often fall flat and at a 167 minute running time is way too long and drawn out. The cinematography is impressive as is Elmer Bernstein's winning score that is highlighted by a highly infectious chorale theme song that plays along with the beautifully illustrated opening titles designed by Robert McGinnis. 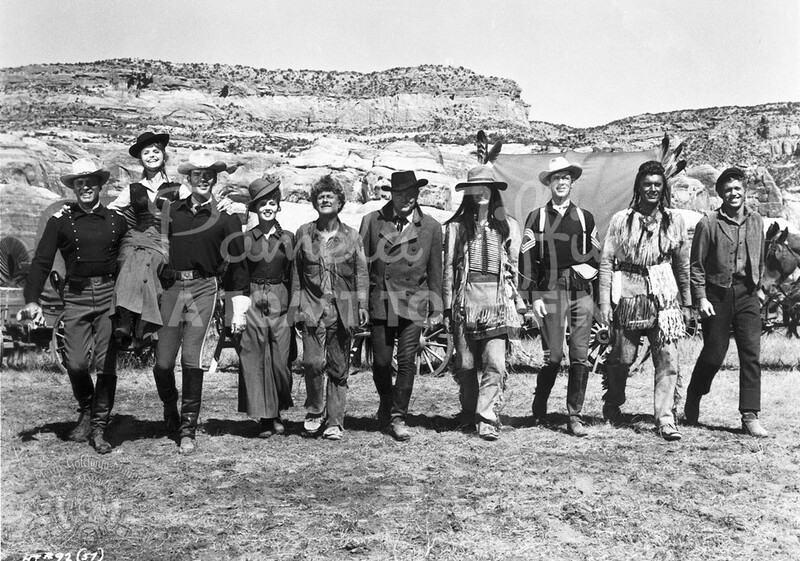 The cast of John Sturges' The Hallelujah Trail. Pamela Tiffin's opening credit title from John Sturges' The Hallelujah Trail designed by legendary illustrator Robert McGinnis. The Hallelujah Trail may not be the best Western spoof out there, that distinction goes to Mel Brooks' Blazing Saddles, but the film is blessed with a talented cast that make the best of the material it is given. After the release of The Hallelujah Trail, Pamela had only one more major Hollywood release, Harper before she ultimately left for Italy.